Diplomacy is the pursuit of a patient exploration of the emotions and freely chosen needs and priorities of all sides in a dispute. Bilateralism is two sides talking it out. Multilateralism is many countries working toward a common goal. Often peacemaking. Theoretically, a friendly but non partial third party helping one side to negotiate with the party with whom it is involved in a conflict with can fall under Multilateralism. They are both thus all but synonymous with diplomacy. But it is not the full measure of diplomacy. Multilateralism and it's younger sister, bilateralism, are useful tools; actually, more than that, the prefered methods of diplomacy. But not the true goal of honest diplomacy, which is peace. Historically, we find that whenever political hawks are criticizing diplomats for being too left wing, what they are really saying is that, there is a certainty that continued pursuit of this line of diplomacy will surely bring further violence, not less violence. For example, when Yugoslavia was negotiated away, sacrificed on the altar as a peace offering to the Nazi regime during the prelude to World War 2. Those talks were multilateral, which for those obsessed with the trappings of peace, as Neville Chamberlain was, should have been a sure fired guarantee of peace. Indeed, he cried out "Peace in our time." Due to the dedicated pursuit of the highest ideals of multilateralism, only without regard to the goals of diplomacy: true peace. It is easy to confuse multilateralism for peacemaking, as 99 percent of the time, that is the way to go. The only proper path to go to get a diplomatic process moving and keep it on track. But there is an inherent dependency within multilateralism. All sides need to be willing to negotiate in good faith. There is no way around that for any peace deal signed to not be destined to fail from the very start. Like a basketball team with less time on the game clock than the shot clock, if the team gets distracted on the current methodology of trying to run it's offense, the game may end before they get to shoot any shot at all towards the basket. Which would be worse than at least firing off a low percentage shot. If the players lose track of time, the game will end very badly. If not, there is a hope for success. Similarly, a diplomat must focus on the greater goal of true peace at all times, even if the minutiae of keeping the diplomatic process going, is the very air that the diplomat breathes. If war breaks out because of the very diplomacy, then it is better that there had been no diplomacy at all to begin with. In the negotiations with the Palestinian Authority, time is about to run out, and Israel must consider a unilateralistic approach that can actually prevent war, rather than continue with multilateral or bilateral diplomacy that only gives terrorists a chance to win the fight to make more innocent blood be spilt. Palestinian Arab leadership must conform to the rules of multinational civilization, not merely pan Arabic conquest, to be a real peace partner with Israel. Relationship building with a group of people who think they need not be civilized at the end of diplomacy, ends the hopes for peace. Whereas, inviting them to realize they cannot get away that, begins a workable relationship framework from which to build a mutual relationship towards a true and lasting peace. Even if these steps must be unilateral, Israel acting on it's own, if it furthers the cause of peace, that is a very good thing. That is the very goal of ideal diplomacy. The goal of ideal diplomacy, is peacemaking. Not the even handed alignment of interests for its own sake. Therefore poor diplomats will repeat ad nauseum the mantra of multilateralism while good diplomats will know when to not interfere with a cessation of negotiations with a pro terroristic leadership. Good diplomats will support a low percentage shot that at least gives the team a chance to win, even if it is a unilateral approach. May the wisdom of this be accepted by all that need to understand it. So that Israel is not any longer goaded by it's allies into being a sacrifice for peace, in it's own land. May that idolatry end forever. May it very soon be so, by the grace of God. 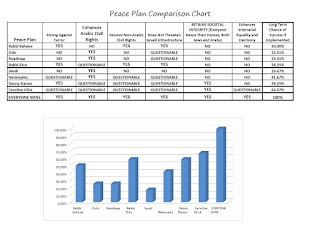 B'Ezras HaShem Yisborach, by the grace of God, in today's post I've updated the popular Jerusalem Defender peace plan comparison chart to include my assessment of the Caroline Glick peace plan. 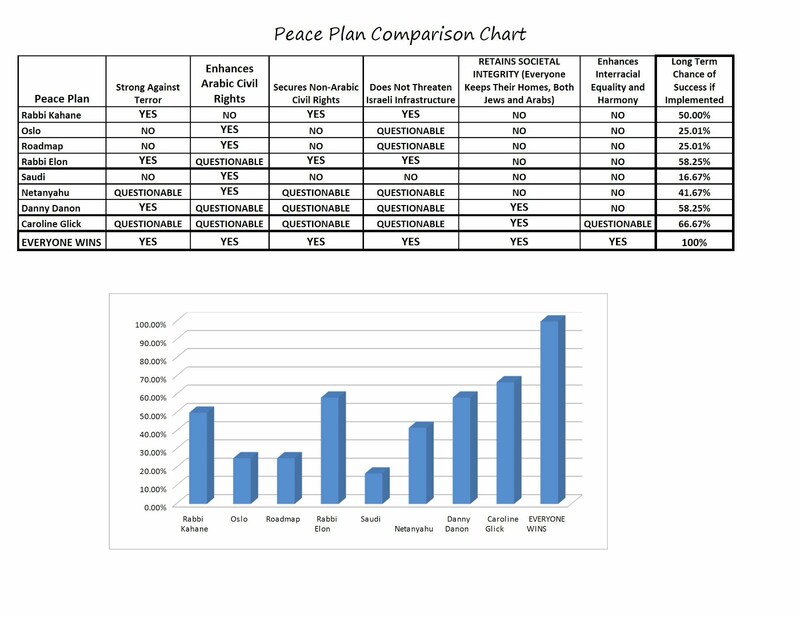 There are now a total of eight other proposed peace plans that are included in this latest version of the chart, all compared using the same six criteria that I have evaluated my Everyone Wins Peace Plan through. Caroline Glick's proposed plan is very wise in several areas. It is unilateral and does not depend on bilateral negotiations with arch terrorists and their supporters. It also does not propose to ignore Scriptural "intel" that forewarns the world that Israel is going to have Judean and Samarian ("West Bank") territories no matter what people try to negotiate away, so it prevents running down a diplomatic path that would be doomed to fail from the start. It further does not destroy current societal configurations as most other peace plan suggestions of the past would. Most importantly, it ends the possibility of those territories being used as staging ground for a war against Israel. This is a plan that actually has a chance to work. The main issues I have with Caroline Glick's proposed plan are that it does not, to my knowledge, demand that current criminals are filtered before given an option to naturalize into Israeli society, and it seems to kick the can of the entire Gaza Strip issue down the road. I believe that you have to filter out terrorists if you are going to naturalize the Palestinian Arabs. You can't naturalize terrorists. As I wrote before, "The beginning of peace does not come by the placation of terror; that is it's anathema." I am also for a more decisive conclusion to the conflict with the Palestinian Arabs that does not allow for war over this issue ever again. As long as Gaza is still out there, what do you think a Hamastan would desire a few years down the road? Not trade and peace, that's for sure. If Fatah could not be trusted for peace, how can you possibly hope to trust Hamas? It seems as if this part of the plan is a manufactured vehicle to avoid naturalizing the Arabs of Gaza, not an actual solution based on a consistent policy. If policy accurately emanates from truly noble principles, consistency should rarely be a problem. We do not need to rely on such a conveniency as this. The process of naturalization, I feel, must be as methodical as necessary to not risk Israeli electoral balance or anything else. Using the slow nature of bureaucracy to everyone's benefit, we can reduce dangerous mistakes that could cost bundles of cash, or even lives. Trying to fix it all overnight is not as good as selecting the correct path as soon as possible, but then taking the time to implement it as wisely as possible. The Glick plan proposes to save the Arabs of Judea and Samaria from despotic leaders, but abandon their cousins in Gaza to that very fate. It calls for increasing the Arabic voting ratio within "Green Line" Israel, giving them more votes than today, but my Everyone Wins plan calls for maintaining current voting ratio levels in the State of Israel.